Which is the Assalt Style Weapon? Thread: Which is the Assalt Style Weapon? 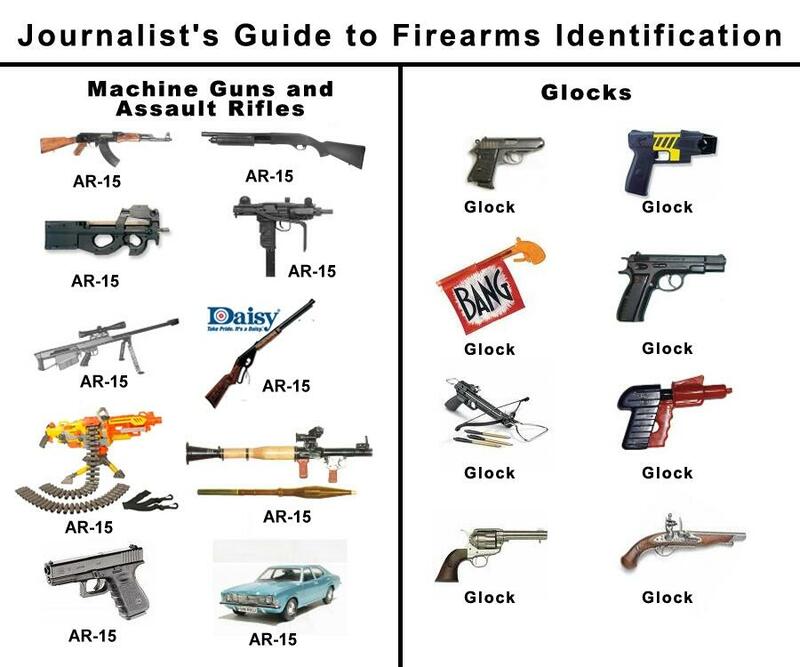 Well, if they (media) had any brains, they would ditch the term Assault Rifle, and call it a Storm Rifle. Directly translated, that's what that compound German word means. Silly Germans and their compound words...messing everything up and all. kmw1954 and OKNewshawk like this. Wait... ...it's white.... ...ya' can't have white! 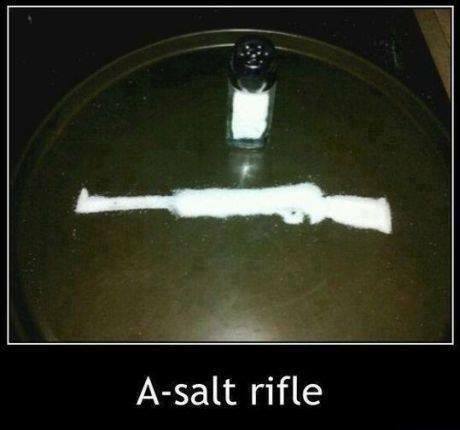 You could make it out of pepper but then it wouldn't be a salt rifle... ...quite the conundrum we have here. If I may alter the focus slightly, one of the firearms mentioned in the original post is the BAR. I watched The Highwaymen last night. Impressive, what a BAR can do. kschilk, rollin thunder, Zen Ape and 1 others like this. Yep... ...they can incapacitate a lot of people in a short time... ...gettin' 'em drunk an' all. My Mom warned me as a kid to stay away from those BARs. This guy must have had one slow waiter. I bet his food was cold. It was Clyde's weapon of choice because not only could it lay down a serious barrage of firepower but it was also reliable in cutting through the heavy steel of cars back then where handgun calibers and buckshot often came up short. kmw1954, WoodyUSSLUCE and loudviking like this. The wording is Precise for a reason I assume. Assault STYLE weapon? Since there's really no clear definition of what an assault weapon is, it would be difficult to assess which of the 2 follows in that style. If you verbally assault a person, using a bullhorn would fulfil the conditions for an assault weapon. That means any paper or flat object rolled in a conical form would meet the criteria for an assault style weapon. I was thinking along the same mindset as you. I'll just add this as well, an assault style weapon is something that is used to assault with. So that means both if the person used either to hit you with it. They need a person's actions to assault you with them. Until then, they are nothing but an inanimate object. So maybe that's why standard capacity mags are dangerous? You can get assaulted with one if thrown? this should splain it to youse guys! Why would anyone consider any gun laws? It is our God given right. We must not let ourselves get dragged into the gun control conversation. It doesn't matter what a gun looks like. You have the right to own it and use it to protect yourself from any threat from a home invader or a rogue tyrannical government. Lets stay focused while our politicians attempt to change the narrative and disarm the only threat to them controlling every aspect of our lives. May God Bless all veterans everywhere and may they help keep us safe in the days ahead.